A new restaurant, lounge, and private dining establishment called BESA Detroit has opened on the first floor and lower level of the Vinton Building at the northeast corner of Woodward Avenue and Congress Street (600 Woodward) in downtown Detroit. Offering 135 seats, the restaurant is owned by Mario Camaj, owner of Tallulah Wine Bar and Bistro in downtown Birmingham, along with Gerti Begaj, and two brothers, Edi and Etrit Demaj. The chef is Kyle Schutte, who previously worked at the Flats in Beverly Hills, Calif. Camaj and Begaj serve as managing partners. 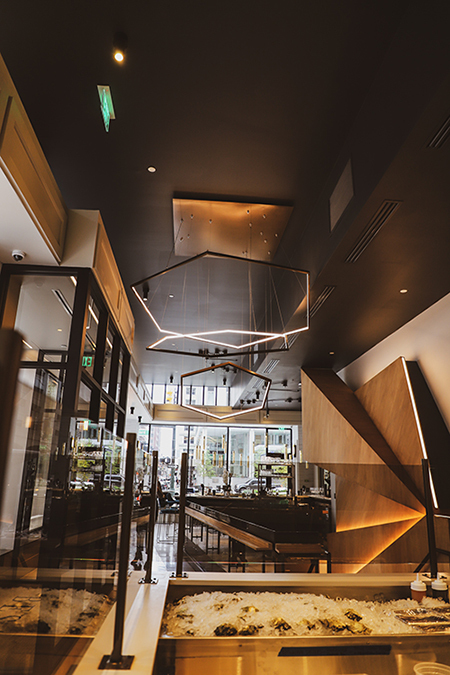 The main level includes a dining room furnished with table-tops, booths, marble finishes, glass lights, a bar area with high-top tables, and a raw bar. The lower-level lounge offers tables and couches and a 12-seat chef’s table dining room for private parties. The restaurant can accommodate parties of up to 200 people. The menu offers a selection of beef, poultry, and seafood dishes, including a pork chop with root beer spices, a raw bar for oysters and crudo, lamb belly porchetta with a slow-cooked egg, sea scallops with masa polenta, coconut udon, and ramen noodle raviolo with a lobster claw. Other selections include daily oysters, wild ahi, green curry soup, Korean-braised duck leg, duck liver mousse, caramelized eggplant, Southern-fried Amish chicken breast, wild Alaskan halibut, trout, Michigan Holstein Ribeye, triple cooked fries, and Brussels sprouts. The word BESA has deep roots in the Albanian culture and language. With four of the owners originally from Albania, the literal translation of BESA is “a pledge of honor.” To give “BESA” is to give your word or make a pact. During the Albanian civil war in the late 1990s, people were fleeing their homes and sought BESA: shelter, clothing, hot food, and protection. Chef Kyle describes his style of cooking as “fun, yet sophisticated; innovative, yet familiar; and humane, yet accessible.” His culinary influences come from America’s South and the Los Angeles area. The sommelier is John Cooke, a native of New Orleans who once worked with Chef Emeril Lagasse at his Nola Restaurant in the French Quarter. Cooke, who arrived in Detroit earlier this year, holds a first-level certification from the Court of Master Sommeliers. The restaurant is open Monday through Saturday from 4 p.m. to 11 p.m. The eatery is closed on Sunday. For more information, call 313-315-3000 or visit BesaDetroit.com. Next articleBlog: Check, Check, But Where Are the Balances?